We had a great time yesterday at the inaugural University of Tennessee Health Science Center (UTHSC) College of Dentistry 5k Run and One Mile for Healthy Smiles Fun Walk. We had quite a few people stop by the table before and after the run, which was great! We passed out a lot of information about The Arc and helped raise awareness abour our missions and goals. As one of the sponsors of the race, we also got our logo on the back of the official race t-shirts, which should be a great marketing tool for us as well. Luke And Margie Adams appeared ready to arrive at the mat second in the 10th leg of CBS' The Amazing Race before a surprise twist: What was supposed to be the 10th pitstop, was actually just another clue. Luke survived a painful - but therapeutic - foot massage and the mother and son duo each swam 200 meters of a 400 meter swim before leaving for what they thought would be the pit stop. Luke Adams is the first contestant on The Amazing Race to be deaf. He and his mom Margie have used their close relationship and communication skills to win three legs of The Amazing Race, tying them with Tammy and Victor for most this season. Come run with us Sunday! 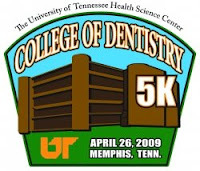 Hey everybody, we're going to be at Forrest Park Sunday afternoon for the inaugural University of Tennessee Health Science Center (UTHSC) College of Dentistry 5k Run. There's also a One Mile for Healthy Smiles Fun Walk for those who don't want go the full 5k distance. The 5k run starts at 3:00 and the 1-mile walk gets going at 3:10. On-site registration for both events start at 2:00. 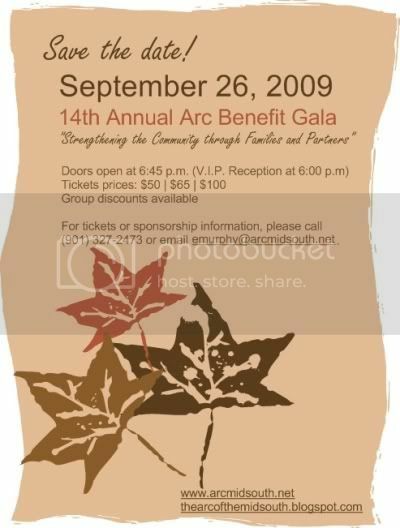 We'll have a sponsor's table at the run and will have information about the agency, including our 14th Annual Arc Benefit Gala coming up in September. Shelby County Mayor AC Wharton will be the keynote speaker and Action News 5's Joe Birch is moderating. The weather forecast is looking great so we hope to see you out there! A.C. Wharton to speak at Gala! We got exciting news today with the announcement that Shelby County mayor A.C. Wharton will be the keynote speaker at our 14th Annual Arc Benefit Gala. With Mayor Wharton speaking and Joe Birch moderating, it's sure to be a fun evening and a great way to raise money to help make a difference in the lives of the Mid-South disability community. This year's event is Saturday, September 26th at the Hilton Hotel in East Memphis. Tickets are now on sale! Prices start at $50 and the doors will open at 6:00 for those with VIP tickets. This year's theme is "Strengthening the Community Through Families and Partners". More information will be available shortly on our website. We had a Great Day at Tiger Book Store! As part of Comcast's "Get Your Move On" promotion, some of our Career Development and Job Placement (CDJP) students worked outside Tiger Bookstore today, distributing free Comcast boxes to University of Memphis students who need them for packing at the rapidly-approaching end of the semester. We had beautiful weather all day and passed out a lot of boxes! Thanks to everyone who stopped by to see us. The Association of University Centers on Disabilities (AUCD) is working with other disability organizations to ensure that long-term services and supports are included in health care reform. One important bill we are advocating for is the Community Choice Act. This would require states to provide Medicaid community-based personal attendant services and supports. It would help correct the institutional bias. It would provide Americans with an equal choice of community-based services. It would also help address waiting lists. Senator Tom Harkin’s office has asked for assistance. They need personal stories that can help make the case of why long-term services and the Community Choice Act should be included in health care reform. They especially would like stories from the developmental disabilities community. Are you caring for a family member or family members who need long-term services? Are you an aging caregiver concerned about future services? Do you have out-of-pocket expenses for long-term services that are difficult for your family? Has providing care impacted your employment? Are you on a waiting list for Medicaid home and community-based long-term services? Have you ever had to move or become poor to get the long-term services you need? Have you experienced the “institutional bias” in Medicaid? Live or at one time lived in an institution or nursing home? Only had a choice of nursing home of institutional placement? There is no set format, but try to keep the stories short (about a page is good). Details are good. Make sure to include your name and what state you live in. They should make the case of why long-term services and the Community Choice Act should be part of health care reform. We did something similar to this during passage of the Family Opportunity Act. We got a lot of great stories that helped Senator Kennedy’s staff. Please share your stories and help pass on through your Consumer Advisory Councils. Health care reform is moving very quickly so we need stories as soon as possible. Send them to Joe Caldwell at AUCD. Luke and Margie arrived at the at mat third in the 9th leg of CBS' The Amazing Race. The top three teams all finished within seconds of each other after a footrace from the final part of the Detour. Tempers flared at the mat as tensions ran high throughout the leg between Margie and Luke and sisters Keisha and Jen. Luke and Jen collided at the the first two clue boxes of the legs and exchanged heated words during the day. Luke Adams is the first contestant on The Amazing Race who is deaf. He and his mom have survived the first 9 legs and still have a shot to win the $1M prize. Another win for Luke and Margie! Luke and Margie Adams bounced back from a grueling seventh leg arrived at the mat first in leg eight of CBS' The Amazing Race. Still in Thailand, the mother/son dynamic duo bested the other remaining four teams as they navigated the congested streets and waterways of Bangkok. The pair was awarded a trip for two to Puerto Rico for their victory. Luke Adams is the first contestant in the history of the show to be deaf. He and his mom Margie have used their close relationship and communication skills to win three legs of The Amazing Race, tying them with Tammy and Victor for most this season. Carlene Leaper, Executive Director of The Arc of the Mid-South, has been named to the Mayor's Advisory Council for Citizens with Disabilities. Her term runs through June 30th, 2011. In her role on the council, Mrs. Leaper will help advise Mayor Herenton and other city officials on the issues that are important to Mid-Southerners with disabilities. Mrs. Leaper feels this is a wonderful opportunity for her to work towards her personal goals and priorities of ensuring that people with disabilities have non-discriminatory access, assistance and services.